We are releasing a beta version of French localization for cloud Bitrix24 service. To change your Bitrix24 account interface to French, simply scroll down to the very bottom and change the flag as seen in the picture below. Again, this is a beta localization, so if you see any parts or interfaces that are translated incorrectly in your opinion, send your corrections to info@bitrix24.com with 'French localization' in the subject. Make sure you attach appropriate screenshot(s). We'd like to thank our great partners who helped us with this project. 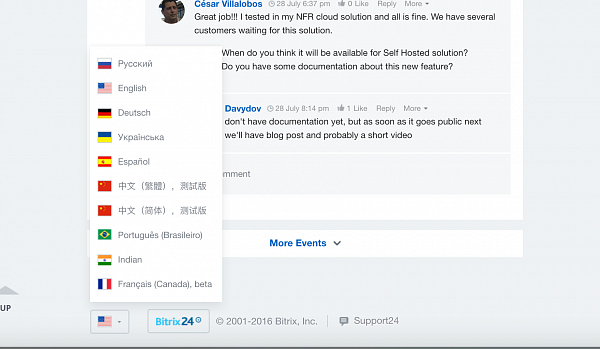 And as a reminder, the self hosted editions of Bitrix24 come with own localization module, so you can translate it in any language you want.